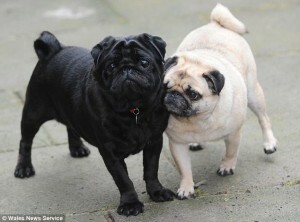 This is very inspirational story about a pug that acts as the eyes for a blind pug. 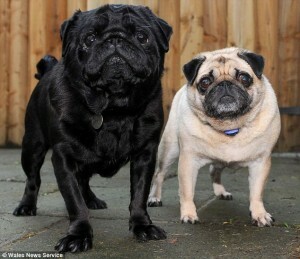 Franky the black pug has taken it upon himself to guide his fawn pug friend Elly. Frank helps Elly on walks, by allowing her to snuggle into him, as he takes the lead. Also Franky will lead Elly to food and water because she isn’t able to find her own way. The pair, both four years old, are inseparable. Elly sniffs the air to find her friend,then nuzzles into his side to trot along with him. They have both been re homed recently by the Newport RSPCA, after a press campaign to re-home them together. They look great and a real inspiration and we are jealous of the new owners. We offered a home to both of them but we were too late. It demonstrates, what we feel, that dogs have empathy for other dogs needs and they feel the pack is of greater importance than themselves. I’ve heard people say that pugs are ignorant, ugly dogs. I think (and it’s true) that they are beautiful, intelligent, gentle and loyal companions. I’ve never heard of a dog helping a blind dog, very inspirational. Makes me want a pug even more for being the most caring and friendly type of dog I know.